A few weeks ago, I went along to a session of the Boffins Books Young Adult Book Club featuring Will Kostakis and Shivaun Plozza (author of Frankie). 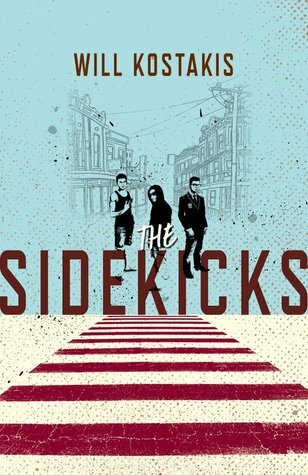 I had already bought a copy of The Sidekicks when it had first come out a month or so earlier, intrigued by the concept behind the book. What if three people all had the same best friend, but weren't friends with each other? What if the best friend died? Where would that leave the other three people? These are the questions that Ryan, Harley and Miles must face after the death of their best friend Isaac in an accident. From the outset, Miles is adamant that the three of them are not friends, but without Isaac around, each of them discovers that the world is a much lonelier place, even if not all of them are totally alone. Ryan is the school's champion swimmer, a golden boy whose mother also happens to be Head of English at the school. However, he is far from the classic stereotype of the Australian golden boy-- he eats incredibly healthy foods to keep fit for his sport, is humble towards his fellow students, has an awesome relationship with his mother, and oh, yeah... he's gay and hasn't told anyone yet. This is perhaps the most fascinating quandary of the whole book. As an adult, the farther away I get from high school, the less I think about how much of a minefield it could be; but for Ryan, he's reminded every day that to be 'gay' is the greatest slur of all. It's used by other students to degrade them for having girly surnames, or to describe activities that are unpleasant. Ryan is not allowed to forget that what he is might be abhorrent to his friends and peers, simply because of the language and stigma that is already embedded in the school's culture. He's pretty sure his Mum would be okay with it, but he can't take the risk. Isaac was one of the only people who knew, and he made Ryan feel safe. Once Isaac is gone, where does that put Ryan? Then there is Harley, or Scott Harley, the local school rebel. There was probably a kid like Harley at every school, a kid that other students were simultaneously scared of and thought was a loser. He's the one with the drug connections, he wears oversized and dirty clothes, he drinks a lot (although he didn't smoke in the book so that was something.) I liked Harley, because he wasn't a stereotype. Kostakis allowed him to have his own say about what was happening, and to show that under the tough and grubby exterior, Harley was suffering too. He felt guilty about what had happened to Isaac, and in his own way, he did something about it. I do feel that perhaps Harley's drug using and his connection to whatever Isaac had taken the night he died was not as fully developed a character aspect as it needed to be, but then again I need to take into account that this is a book for young adult readers. What I really did like about Harley was his quest for justice-- in as much vigilante fashion as a high school student could be capable of, Harley set out to right some wrongs, and he didn't punch anyone once. While Ryan was still my favourite character, I quite enjoyed reading Harley's point of view-- spelling and grammar errors (deliberate on part of the author in creating the voice) and all. The final section of the book is devoted to Miles, who is called The Nerd in the breakdown on the back of the book, but again, this is not a book that contains stereotypes. Miles reads a lot, and he gets excellent marks at school, but his priorities are not learning. The grades seem to be what matter to Miles. He likes being smarter than the people around him, he's sometimes quite abrasive and he corrects people a lot. I'm not 100% sure why Isaac hung around with him, and I guess that's the point because neither is Miles. Miles' entire section is told in the form of a kind of screenplay, because Miles' passion is film-making. In fact, one of the last things he did with Isaac was make a film called Point of View, a film with a split screen showing different interpretations of the same event. This film structure closely resembles the structure of The Sidekicks, where certain events are seen from three sides and often come off very differently. For example, in Miles' story, he doesn't say awkward things like "I have a girlfriend" when he's introduced to Harley's friend Jacs at a social function, something which made him come off like a bit of a dickhead in Harley's version of the same event. Because Miles' story came last, some of the scenes we'd already seen were written in a way that glossed over bits from the other versions, possibly to not rehash dialogue and action, but the effect was that some of the scenes felt quick. Nonetheless, Miles' way of dealing with his grief was beautifully realised, and some of the scenes in which he re-watched old video footage of Isaac as a way of spending more time with his friend was really heart wrenching. This book has a great repertoire of teen voices showcased in its pages, and it's a highly original story about some very important themes. If you love great Australian Young Adult literature, please give this ago-- even if you don't consider yourself a young adult! I gave it four stars.